Itanagar Police arrested two persons from Niti Vihar and recovered huge numbers of stolen items including mobile phone, cameras, laptop etc. Capital police arrested two persons and recovered huge number of stolen items including Mobiule phones, Laptops, Tablets, Cameras, TV Sets, Watches, Music system and cash. Arrested persons identified as Goken Gongo age 20yrs and Toko Tatam age 19 yrs. Police received an FIR from one Miss Oshin Eko of Niti Vihar, Itanagar on 18/11/2018 against an unknown person who stolen away many items including 2 Nos of Laptop, 2 nos of mobile handset, 1 tablet and some cash amount etc total worth of Rs 2. 7 Lakes from her rented house near Senki View Tinali. On receipt of the above FIR a case vide Itanagar PS Case No- 316/2018 U/S- 457/380 IPC has been registered and SI Randhir Kr Jha for assigned investigation. Consequently, a police team consist of SI R.K Jha and OC PS Inspector. T. Bage led by Dy SP Kamdam Sikom, SDPO, Itanagar under the active supervision of Superintendent of Police Capital Complex launched the investigation of the case and rounded up many habitual criminals. After a week i.e. on 28/11/18 the team got a major breakthrough into the case when two persons namely Goken Gongo and Toko Tatam were arrested from near Rajbhawan tri junction, Itanagar having in possession of stolen mobile handset of the instant case. Thenafter an intensive search was conducted by I/O SI R. K. Jha and his team led by SDPO Itanagar K. Sikom, which have recovered Laptop- 05 Nos, Mobile Handset- 06 Nos, Tablets- 01 No, DSLR Camera- 01 No, Wrist Watch- 04 Nos, T.V- 01 No, Sound System- 04 Nos, Various Currency Notes from 10 countries like, Bhutan, Sri Lanka, Bangladesh, Myanmar, Nepal, China, Combodia, Thailand, Singapore and India and many other items which were stolen from various part of capital complex and Daporijo. 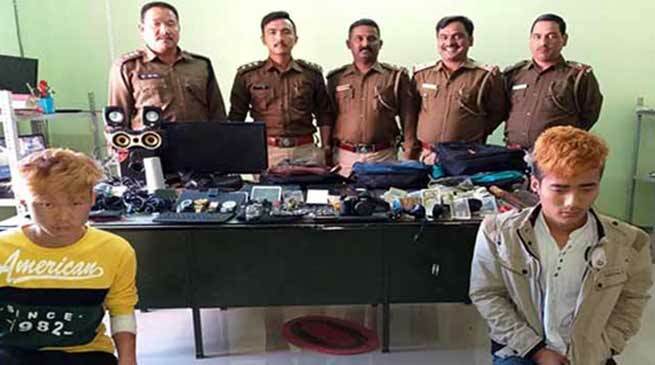 Meanwhile Investigation is still on and it seems that many more cases of Itanagar and Daporijo PS are connected with the arrested person and seized items. Further SP Capital alerted the dwellers of Itanagar to keep sharp vigil on anti Social elements and cooperate Capital Police in nabbing such criminals.